Try this delicious redo of an old family favorite. Try it with Veggie Chick- Burgers and Oven-baked fries (recipes in NJFV) for a quick, easy and satisfying supper. Recipe makes 4 side servings, adjust amounts according to how many guests you are planning for. 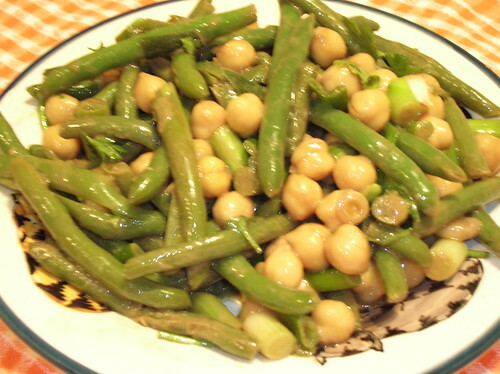 Combine chickpeas, beans and onions in a medium-sized salad bowl. In a small bowl combine remaining ingredients. Pour over vegetables and stir to combine thoroughly. Cover and refrigerate for at least 1 hour. Serve on a bed of lettuce leaves if desired. Reprinted from Not Just for Vegetarians by Geraldine Hartman. All rights reserved. This was the first recipe I tried from your book and it’s delicious! In fact, I think I’ll make it again this weekend. Yum! This will be a nice treat for the “Beanie Babies” — or at least their owners! Seriously, this sounds delish, G.
Mmm green beans…they are ready to be picked in my garden. Aiyana loves chick peas! She eats some cooked foods. Hi Beth, Glad you are enjoying my cookbook. This is one of my fav. salads too. I am not a fan of ‘sweet’ bean salads, I like them tangy, as this one is. Hi Meezer’s Meowmie,Let me know how the veggie-adventures are going. Thanks for the kind words and compliments re: my recipes on your blog, much appreciated! Hi K, Beanie Babies and friends, all should enjoy! Hi Tasha, Sounds like a GREAT idea, can I come??? I am so going to try this too! This salad looks beyond delicious! I will certainly be tossing this together tomorrow! Thanks for sharing it!